In The Comfort of People, author and world-renowned anthropologist Daniel Miller challenges readers to assess what is important in life in this latest study chronicle that reveals how much is really going on behind-the-scenes of caretakers and their subjects who work through various challenges. This book continues Miller’s book series about material culture that began with The Comfort of Things in 2008 followed by Stuff in 2009. This unique study of society, science and health takes place contemporary London, England as Miller (Losing Control, Finding Serenity: How the Need to Control Hurts Us and How to Let It Go) fills the book with material from a 17-month investigation of 30 households in a randomly chosen street. Miller shares and chronicles how these people adjust, cope, and conquer amid some stark diagnoses and seemingly hopeless situations. The people and things behind these doors give readers the clues into their detailed lives as they contend with loneliness, depression, tragedy, living conditions, obsessions, and environmental considerations. Miller’s own personal experience comes through well in the foreword written by Dr. Ross Taylor. “I have learnt over the years, as a hospice physician that, as life ebbs, connections become ever more important. Connections to family, friends, enemies, and community. It’s almost as if the energy to face loss is gathered from others…ultimately these stories show that choices about communications and connection are pivotal to experiencing closure, and we should respect and understand the value and power of each – face to face, text, phone or Facebook.” The books “Acknowledgments” and “Introduction” enhance the base research where Miller communicates each subject’s story with great purpose. Each chapter or “Story” acts as a portrait about people, places and perceptions. Story 12 is about depression, which is not an easily defined concept because it means so many different things to so many different people. Miller keeps a tight focus in this portrait with a personal, informative approach. I cried pretty early reading this book, which has echoes of an ethnography, but stretches a wide range of conditions, emotions and perspectives through the personal narratives. The first story, “Sarah”, begins with “It was six days before her death” and continues with her raw, poignant communication to others using Facebook. The third story, “The Curse Of Confidentiality,” is an especially telling narrative just like the twelfth story “Depression” and the next story “Community.” These subjects are almost essential topics in this work and Miller rightly devotes an entire section to them though elements of each appear throughout this book. The hopeful accounts of community (Story 16 – “The Silent Community”) and friendship were uplifting and genuine. Miller even gets some heartfelt laughter from some of these moments, which balances the tragedy. Miller’s ending insights in the “Conclusions” section really cultivate the research observations, personal stories, and communication theories/touchpoints for an even richer reading experience. Published by John Wiley & Sons, The Comfort of People (9781509524327) comes highly recommended (***1/2 out of four stars). Home care specialists will take a particular interest in this book, but it’s one for everyone. 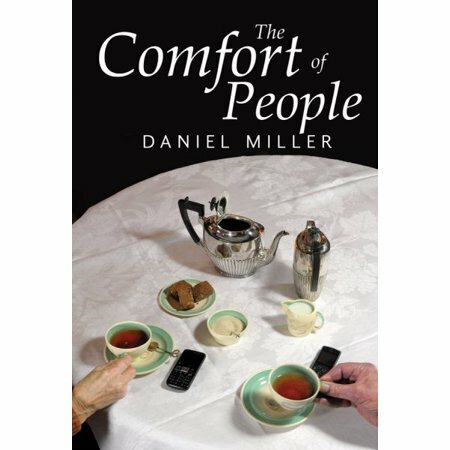 This entry was posted in Book Reviews and tagged Books, Daniel Miller, hospice, Michael Siebenaler, Mike Siebenaler, Tall Writer, The Comfort of People. Bookmark the permalink.